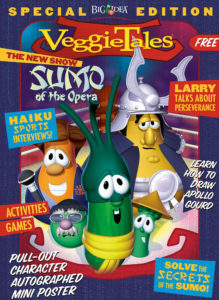 In 2004, Big Idea released VeggieTales Sumo of the Opera, a sort of Rocky/Mikado-inspired show. 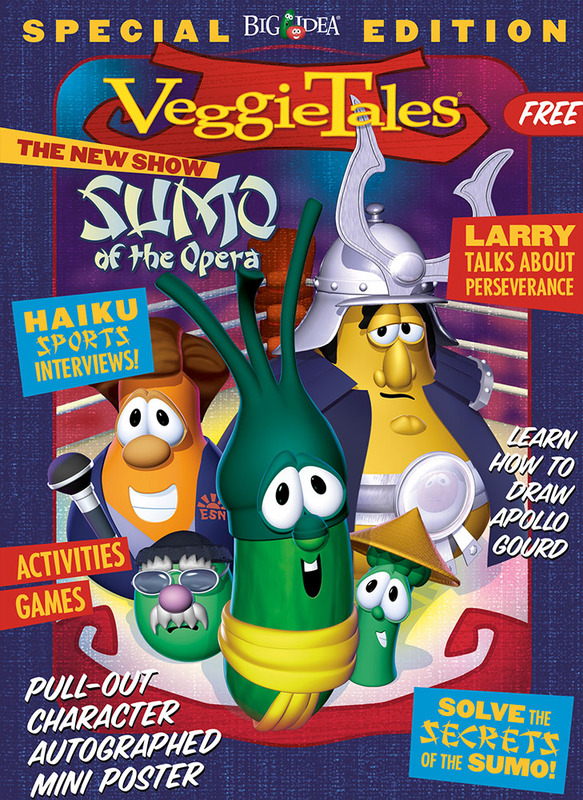 As part of the promotional efforts of shows at that time, we produced mini magazines, and the Sumo mini-mag was the first one out of the gate. Naturally, I decided to include Haiku Sports Interviews. I mean, wouldn’t you? Arguably, this little interview segment is the strangest thing that I’ve ever done for the Veggies. I knew it would miss a few landings with the readers, but I got a kick out of it. Maybe Marketing was just trying to keep me happy – I dunno – but it was approved somehow. 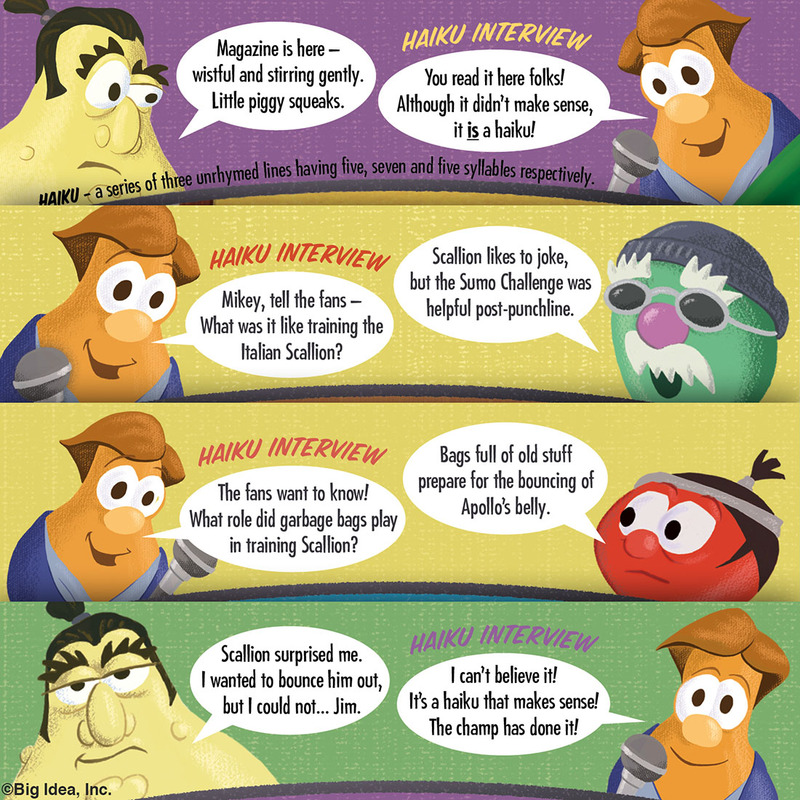 Nevertheless, I abandoned the Haiku theme in subsequent VT mini-mags for other oddly-themed interview segments. Interviews of Mystery – Interviewee gave the answers first to which the reporter then asked matching questions. Interviewer Interviews – This was really just an excuse to tell a normal joke with a reporter-style voice. Knock-Knock Interviews – This idea actually sounds funnier than it ended up being. The idea is that the interviewee would begin by saying “knock knock,” of course, and the reporter would respond in kind. It was easy enough to understand, but harder to make funny because the characters had to keep talking through the point where the punchline should have been. 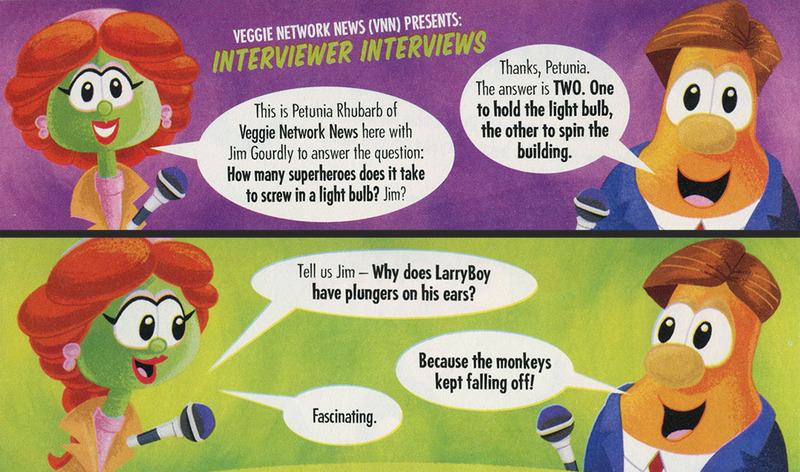 I’ll leave you with a couple standard kid-jokes from LarryBoy and the Bad Apple Interviewer Interviews! Odds & Ends is a blog series in which I’ll be posting all the stuff that doesn’t seem to fit quite right with anything else!